Serratia marcescens is an important clinical pathogen in human medicine today. Here, an infectious diseases pharmacist identifies 5 interesting things about this Gram negative bacterium. Serratia marcescens is a rod-shaped Gram negative bacterium of the Enterobacteriaceae family that was first described in 1819. It is found widely throughout the environment, including in the soil and water. It is associated with plants, insects, and animals. In clinical practice it is the most common species of the genus Serratia to cause human infection and it has been found to cause urinary tract infection, meningitis, pneumonia, infective endocarditis, catheter-associated bloodstream infection, wound infection, and more. Many people in the health professions have likely heard of S. marcescens, but it is unlikely that many are familiar with this organism beyond the context of a few clinical conditions that it can cause. In an effort to call more attention to this important human pathogen and for the sake of sharing some interesting facts, the following is provided. The first description of S. marcescens is from a man named Bartolomeo Bizio who was a pharmacist that resided in the Padua Province of Italy in the early 1800s. At that time polenta was an important food of the people, but the cornmeal dish was found to be discolored red during a particularly warm and humid summer. Many strains of S. marcescens have a red pigment, as shown in the picture below. Through experimentation Bizio was able to cultivate the organism from fresh polenta. He first published his findings anonymously, but later was acknowledged as the author. Bizio chose the name S. marcesens after an Italian physicist named Sarafino Serrati who had pioneered work with steamboats. Like several others after him, Bizio believed the organism was a fungi, but more advanced technology later revealed it was actually a bacteria. Interestingly, S. marcescens has one of the most confusing taxonomies of any bacteria and was given 17 other names before finally being officially named in 1980. 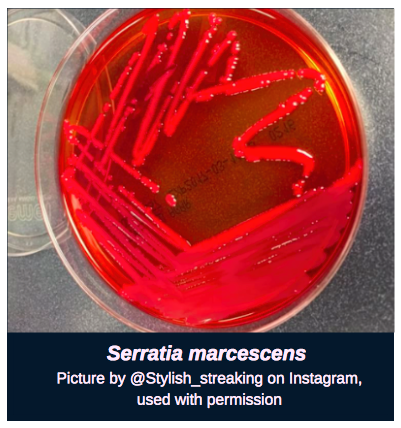 Due to the ability of S. marcescens to contaminate food products and turn them a reddish color, it is believed that it may be responsible for events described as miraculous, which occurred prior to our understanding of microorganisms. One example is from 332 B.C. when bloody bread was said to foretell the fall of a city called Tyre, which was then overtaken. The history books have a number of references to “bleeding” bread that is likely the result of this organism. While the precise role S. marcescens played in the past will likely never be fully understood, it certainly makes you wonder how it may have influenced the course of history. S. marcescens has been used in many human experiments throughout history and one reason for this is because it was not widely accepted as a clinical pathogen in humans until after the 1970s. Today we know that S. marcescens is an important cause of infections in humans. Many of the studies previously performed in humans (of which many people were not aware they were participants) would be considered unethical today. Since S. marcescens is relatively easy to identify and was thought to be non-pathogenic, it has been used as a tracer organism for studying the movement of particles through air and water. From the 1940s into the 1960s the United States military utilized S. marcescens to conduct experiments on military bases and the general population. One of the most well known experiments of this kind was performed on the population of San Francisco and within the New York City subway in 1950. These activities aimed to determine vulnerability to biological warfare attacks. At least one person in San Francisco is believed to have died from this experiment. The use of S. marcesens by the U.S. military is well documented and more information on this can be found here. The “SPACE” organisms are a group of bacteria that harbor genes within their chromosomes (e.g., AmpC), which if expressed, can cause the production of antibiotic-destroying beta-lactamase enzymes. The SPACE bugs are: Serratia, Pseudomonas, Acinetobacter, Citrobacter, and Enterobacter. 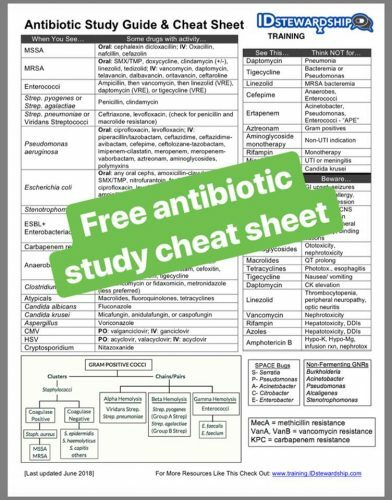 Exposure to antibiotics can cause these organisms to express AmpC, which in turn makes the organism multidrug-resistant and a challenge for clinicians to combat. Being a SPACE organism and potential expresser of the AmpC gene makes S. marcescens notable in the world of antibiotic resistance. Beyond chromosomal-mediated resistance, it also has the ability to acquire resistance mechanisms from other bacteria and is intrinsically resistant to penicillin G, clindamycin, macrolides, glycopeptides, linezolid, and rifampin. Most isolates of S. marcescens are also resistant to aminopenicillins, narrow-spectrum cephalosporins, cephamycins, nitrofurantoin, and last-line antibiotic colistin. There is no antibiotic that is widely considered the drug of choice for S. marcescens. Mahlen SD. Serratia infections: from military experiments to current practice. Clinical Microbiology Reviews. 2011; 24(4): 755-791. Macdougall C. Beyond susceptible and resistant, part 1: treatment of infections due to Gram-negative organisms with inducible beta-lactamases. Journal of Pediatric Pharmacology and Therapeutics. 2011; 16: 23-30.